Its been a frustrating experience this week with the upload Monday order processing problem and not knowing when our orders would arrive but It sounds like everybody has received a $25 gift card by email, and if your order was successfully filled, upgraded shipping. I didn’t think upgraded shipping would work for me since when I order Monday night, my shipment usually arrives on Wednesday (pretty excellent for free shipping!!). When my shipping notice arrived last night I immediately checked the tracking number and it looks like Fedex had already picked up the parcel and taken it to their distribution centre. It will be out for delivery on Monday morning.Unfortunately, some people have received order cancellations for the more popular items that sold out, and some peoples orders are still stuck in ‘processing’. 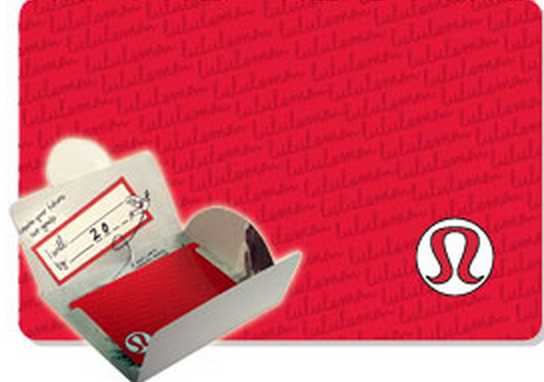 I think that lululemon has communicated well throughout all this starting with emails out on Wednesday evening. I sent out an email to them inquiring about my order and received a response almost immediately giving me a timeline of when I would receive an update email. I am also glad they are acknowledging the frustration by sending out egift cards. I think this is a very costly blunder for them and will absolutely effect their quarterly earnings. An entire week of no online sales (credit cards didn’t get charged until the orders went through), and limited store deliveries of products has probably made a pretty big dent in their bottom line. This ordering situation effected Monday night upload in all ecommerce stores (Canada, US, Australia etc) and Wednesdays WMTM upload. "New WAFS Cadet Blue Wunder Unders"
"Lullaby Blue In The Flow Crops"